For the longest time, expedition tents have been expensive, bulky, and heavy—because they had to be. I once slept eight nights at 19,200 feet on Aconcagua, the highest peak in South America, during a 22-day expedition. We waited out two storms and made two summits of different routes. The Andes mountains are known for the Viento Blanco, the cold and relentless "white winds" that have frozen many fingers and toes and taken many lives. We had a Mountain Hardwear Trango 3 and it withstood the storms, the sun and the cold, and it was still in good shape for a second expedition a few weeks later. We chose the right tent for that trip. On another trip in the Sangre de Cristo range of Colorado, I once watched my lightweight tent fly shred to pieces and the poles bend flat during a standard Sangre windstorm. It was summer, and we didn't want a heavy and bulky expedition tent because of the extensive mileage and difficulty in the objectives we'd planned. We chose the wrong tent, but an expedition tent would not have been right, either. There wasn't a perfect tent for us at the time. After our tent shredded, we took a gamble on good weather and spent the rest of that trip sleeping under the stars and overhanging boulders. We got lucky. Selecting the right tent for the situation can make or break a backcountry trip. 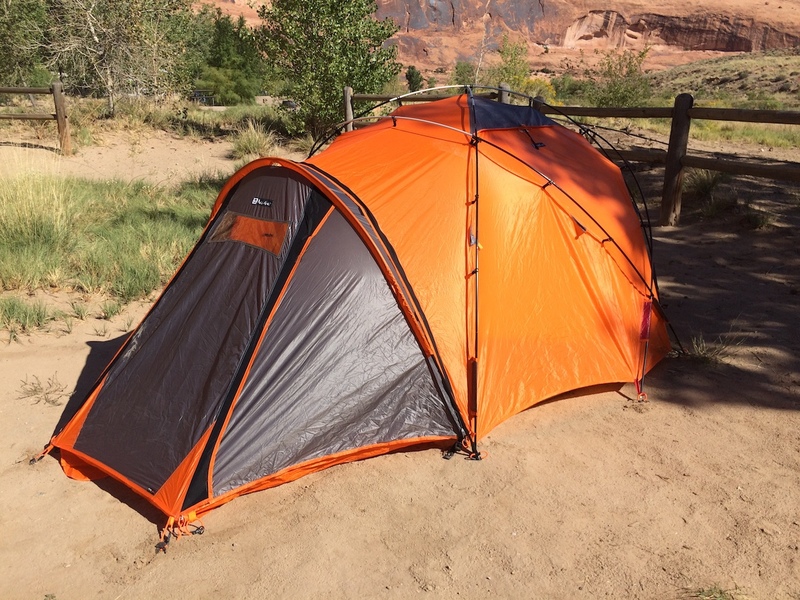 NEMO, a small New England company, has now added an innovative tent design that fills the gap between expedition tents and lightweight mountaineering tents. The three-person Chogori Mountaineering tent is a blend of old-school expedition tent structure with new-school materials and cut-the-corner subtractions to save weight. With almost any product that promotes itself as lightweight, there are going to be pros and cons that contrast the pros and cons of the heavier items. Heavier items are typically going to be more durable and bulky. Lighter weight typically means less durable, smaller packability, and sometimes less versatile. This is definitely the case when comparing the lightweight NEMO Chogori to its heavier competitors. The three-person Chogori Mountaineering tent was created in the same fashion as the tried and true North Face VE 25 and Mountain Hardwear Trango 3 tents. There are other expedition tents on the market, but these two tents set and maintain the standard in the Greater Ranges and wherever snow, wind, extreme sun exposure and cold temperatures dominate the weather forecast. These tents withstand trip after trip. They don't buckle under heavy winds. The tent flies fade under the sun but last for quite a while. The tents are large and can fit two people with a lot of expedition equipment comfortably. Here's the problem: they are heavy and bulky, coming in at 10.5 to 12 pounds (depending on whether you are carrying the cords and stuffsack) and taking up a significant amount of space inside a backpack. The North Face and Mountain Hardwear tents make a lot of sense on a big mountain expedition when they will be set up in the same camp for multiple days with many days purposed to ferrying loads and acclimatization. They even make sense in the desert. Honestly, I have seen tents tested more by the elements in Joshua Tree, Red Rock and Moab than just about anywhere else. But what about shorter climbs like Mt. Rainier, Mt. Baker and Mt. Shasta? And what about more alpine-style trips where little time is spent at camps and light packs are necessary? What about my trip in the Sangre de Cristos? This is where NEMO's new tent comes into play. The three-person Chogori Mountaineering tent (7lbs., 11oz. or 8lbs., 7oz., depending on if all parts are being carried or not) shaves off three pounds by using silicone-impregnated nylon instead of the common heavier waterproofed nylons. The Chogori's tent body and fly are attached—there are no hooks, sleeves, or Velcro pieces to connect the fly to the body, and instead the two are permanently sewn together with airspace in between. Additionally, there are fewer mesh pieces inside the tent and the floor space is slightly smaller (Chogori has 44.3 sq. ft. while the VE 25 and Trango 3 both have 48 sq. ft.). The floor space would be a problem in the Chogori if you're trying to fit three people, but it's possible if everyone isn't too tall or wide. On expeditions, most climbers use a three-person tent for two people so there is room to move around, dry out wet clothing, play cards, stretch and so on. Occasionally, climbers will cram three people into a three-person tent on a light-and-fast effort, or because they are younger and haven't yet developed adult needs for personal space, or most often because they simply haven't made the mistake of squeezing three in there yet. So, the Chogori tent, coming in at 4 square feet smaller, is not a big deal if only two climbers are planning to use it. It may also fit better in many of the tent sites with premade rock walls found on popular mountains. Before looking into the cons of this tent, I've found a couple more positives worth mentioning. With the fly and body incorporated, the Chogori sets up and is taken down quickly, which comes in handy in a snowstorm or in heavy winds. Because of the silicone-impregnated nylon, a waterproofing system for thinner nylons, the tent packs smaller and compresses into the depths of a backpack more easily. With these many positives, there are also some aspects that limit the Chogori's quality on larger expeditions. For example, since you can't separate the fly and body, you have to devote some extra time and effort to drying out the area between the two. It also means that it's not easy to replace a faded or ripped tent fly. On expedition tents, the zippers on the body often wear out first because of the way that wind blows dirt and sand into the zippers. The fly often goes next because of the extreme sun exposure at higher altitudes. 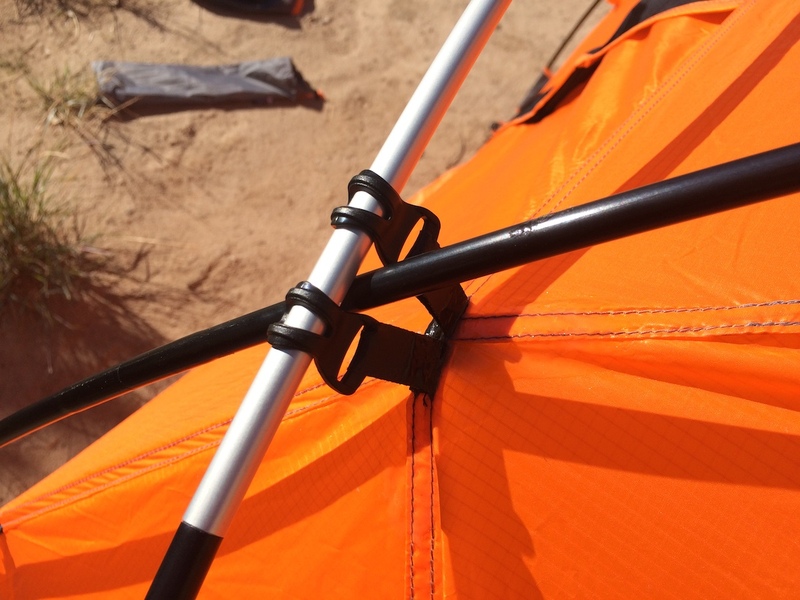 While the zippers on the tent can be repaired, expedition outfitters, as well as climbers who go on frequent trips, generally have to purchase new tent flies every few years. For the average weekend warrior, these problems are not a concern—an infrequently used expedition tent can last for a couple of decades. One issue I don't like about the Chogori for certain situations is that the roof vents do not have mesh coverings. In other words, if the vents are open, there is no protection from insects. In higher elevations or when the weather is cold, this is not a problem because the vents may be closed or there are no bugs. It is a problem, however, when the approach to a larger mountain includes travel through wet, springtime and early summer forests such as in the Pacific Northwest (Mt. Jefferson in Oregon being a good example). The Wind Rivers of Wyoming can also be very treacherously infested with bugs during the prime summer climbing season. This is one of those classic weight-versus-utility decisions. To get the weight down, you've got to let go of certain comforts and durabilities. When you're faced with swarms of mosquitos, however, those comforts are necessary, for me at least. There are a few final functionality and durability losses worth mentioning that allow the drop in the Chogori's weight. First, silicone-impregnated nylon is lighter than thicker nylon, but is noticeably more flimsy. In the wind, this stuff flaps like crazy. The heavier tents have a thicker fly that flaps less. Second, the Chogori is missing small loops around the bottom edge of the fly that are used for pulling the fly out and away from the tent body. On trips above treeline in windy places, the fly of an expedition tent is often tied down by more than 20 points to keep the rain and snow out, to keep the tent from flying away during the day when everyone is out climbing and to prevent flapping at night so everyone can sleep. These missing loops and the lighter-weight material are a recipe for a sleepless night on the side of a windy mountain—don't forget your ear plugs. Finally, the poles are attached to the outside of the Chogori with small, black, plastic hooks. These hooks are less durable and solid than those found on the Trango 3 (the VE 25 uses sleeves instead of hooks). On a trip to Moab, I noticed one of the hooks popped off after a windy night. On a positive note, NEMO's double-hook system that traps a second pole under a primary pole (see photo) is a creative solution that Mountain Hardwear solves with both poles being clipped into a single, heavier clip. With all that said, the NEMO three-person Chogori Mountaineering tent is the perfect option for a large variety of mountaineering objectives, Mt. Rainier being the obvious example. On Mt. Rainier, if there is any chance of nasty weather (and there often is), an expedition tent is necessary. But for only a one- or two-night adventure, the 11-pound, bulky, big mountain expedition tents seem a little overkill. Many climbers do up-and-overs on Rainier, climbing a route like the Kautz Glacier with low-angle ice while carrying all the overnight camping supplies and then descending a different route. The Chogori would be ideal for this type of excursion, and for many others. I will not hesitate to use it again for weekend mountaineering objectives (unless there are mosquitos) and fast-and-light technical expeditions. 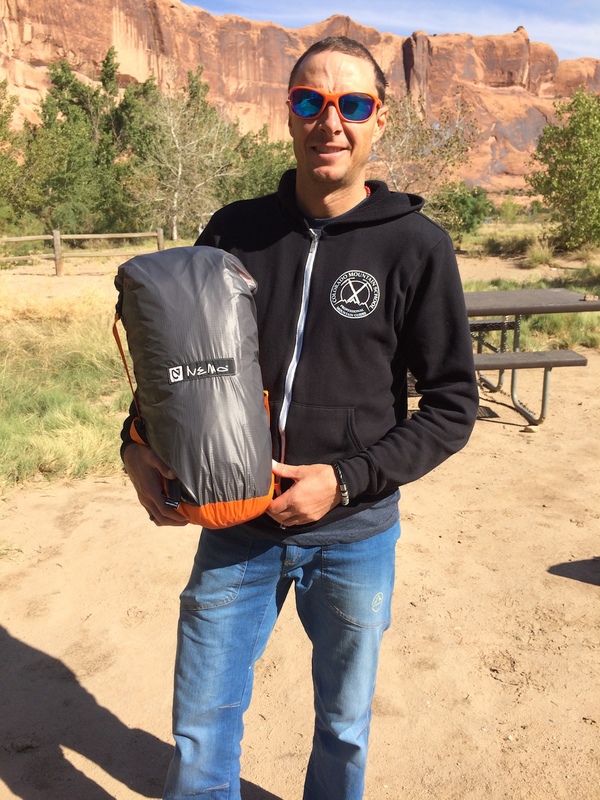 Mike Lewis is an IFMGA/AMGA Mountain Guide living in Estes Park, Colorado. Mike has been guiding and instructing since 1993 throughout the US and internationally.